I am planning to open some my technical notes with example code snippets. Text will be in Markdown (.md) and reStructuredText (.rst) files. 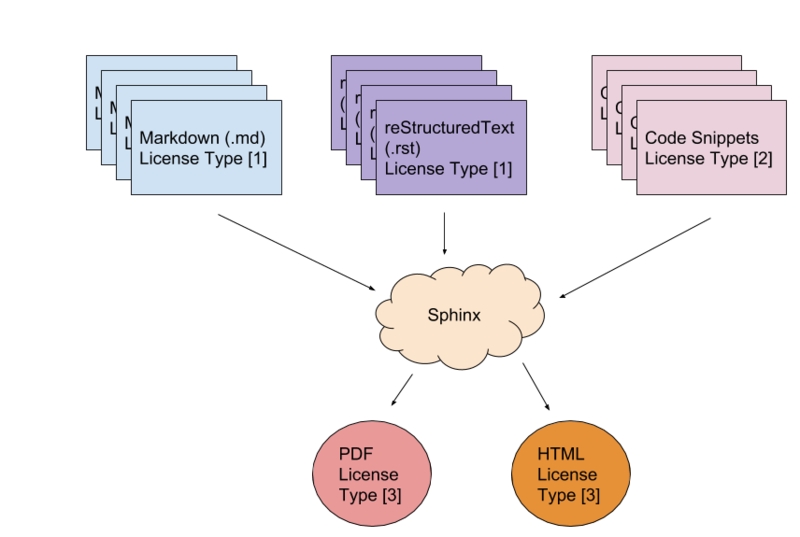 Output document (PDF or HTML) will be generated, let's say by Sphinx, and will be hosted on Read the Docs. Source code (md, rst and code snippets) will be hosted on Github. Flow is illustrated in the figure below. I want to enable potential contributors contribute easily. On the other hand, I want to prohibit commercial usage. In that case how should I choose type , , ? How should I indicate licenses? Who are the copyright owners if someone contributes? I checked several online resources but couldn't find a clear solution. Let's say that source code of text sections is licensed by , code snippets by  and final documents by . I think that I can use CC BY-NC-SA 4.0 for type . By doing so anyone can change the document but can't sell it. But what are proper choices for  and ? For , if source code of text is considered as code then I think CC BY-SA (with/with out NC) isn't suitable because usage of CC BY-SA is discouraged for code. If I choose CC BY-NC-SA for , can I use GPL for  and compile all sources to generate a output which is licensed as CC BY-NC-SA? Does this violates GPL? Let's say that I decide which licens to use. How should I indicate licenses? I am planning to organize the source such that md and rst files are in Folder 1 and code snippets are in Folder 2. So should I create differente LICENSE file in each folder if  and  are different? Should I indicate a license (and probably copyright statement) in each file as a comment? As the output document gets created by an automated process, there is not enough creative work in the creation of that document to make it copyrightable in its own right. The output document can only be licensed under the combination of licenses that cover the documentation source and the code snippets. This means license  will be a combination of licenses  and . For the code snippets, as you don't consider them that important for copyright protection, I would recommend to use the MIT license, which is a permissive license. But the GPL license is also a possibility. For the document source, I would recommend CC BY-SA or a variation on it, because it comes closest to what you want to achieve. Apart from adding LICENCE files to the various folders, you should also make sure that a clear indication ends up in the final document stating the license that applies to the text and the license that applies to the code snippets. Not the answer you're looking for? Browse other questions tagged gpl documentation cc-by-nc-sa or ask your own question. creativecommons by-nc-sa 4.0 Non Commercial Virality? How could I copyleft a document that contains a substantial amount of both code and prose?